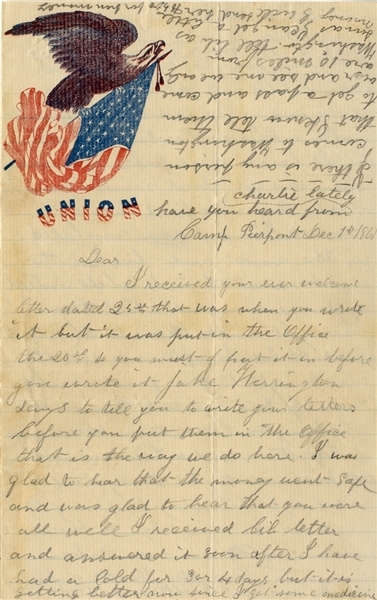 A Union soldier’s letter written by Lewis M. Prall, Co A of the 30th Pennsylvania Infantry, signed Lew.Camp Pierpont, Dec. 1, 1861, 4pp.In part, “On last Tuesday evening the first Cavalry regiment went out towards Leesburg where the Rebels have a large force lying .. they were fired into by about 300 secessionists concealed in the woods... 4 Rebels killed and one wounded ... also 13 other prisoners. .. They took Dr. day out of bed and brought him along. He is one of the rankest Secesh in Virginia. ... They shot poison balls at our men. If it had been me that had taken them prisoners, I would not of brought them to camp. I would of shot the cowardly dogs. they brought the wounded Secesh and one of our wounded men in an ambulance together. Both shot in the head. Our man wanted the men to give him a pistol to shoot the Secesh, but they would not. If it had been me, I would very soon gave it to him, for any person who puts poison in their balls ought to be killed. ...” VG.